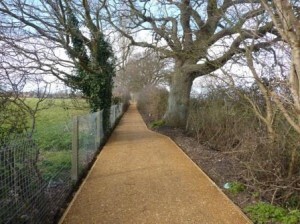 Hampshire County Council (HCC) have now laid a new surface on the path running north-south between Mill Rythe and Eastwood Close known as the cinder track, or more formally as Footpath 88. This has been done to make the path ‘dual use’ so that cyclists can now avoid the very busy and congested main Church Road. This path runs just to the east of Hayling College and ends close to the Mill Rythe school campus, and so has been specifically created for those travelling to and from school during the very busy morning and afternoon school trips. HCC still have some ‘finishing off’ to do, such as putting up signs, but with all the barriers, machinery and material now gone the route is available for use. Enjoy and Happy Cycling to all our website viewers!